If you didn’t know it left or that someone stole it, I’ll give you a pass. Medicine has been disguised for a long time now. And, when you leave the scene in camouflage, you often go unnoticed. Medicine is supposed to be the science or practice of diagnosing, treating, and preventing disease. I love medicine. There’s so much to learn. Lots of complexities and so many people to help. Medicine gives me an avenue to serve, because if we don’t have our health, what do we have? Illness. And, none of us want that. I’ve trained to be a physician. I’ve learned lots of things that can help you with sickness. But, in order to do this, they have to let me practice. And, yes, they are the people who have taken medicine. When did medicine become more about meeting than doing? When I first became interested in medicine, physicians worked. We worked days and nights, hours on end. We learned by working. We worked by doing. And, things weren’t perfect then. But, we took care of patients by actually doing something that literally moved the needle. Now, it’s different. We just meet about it. Toward the end of my medical training, administrative meetings were already running rampant. We’d meet because some group said we should be doing a quality improvement project. Just some new regulatory thing. Gotta come up with a project. Every year. News flash for the folks scheduling meetings: that’s not how innovation works. Bureaucracies don’t drive innovation. Never have. Never will. I’ll tell you how we did those practice improvement projects that someone else told us we should be doing. We usually would type up some protocol that we were already doing and then add it as another formal policy. Box checked. That’s what humans do when they are given futile tasks with poor incentives. Meetings in health care have really just become smokescreens for government-driven busywork. Sure, they can be functional, and in fact, they always add more functions for all of us to be doing. But, most of the time these meetings aren’t productive for patient care because they’ve lost sight of the one thing medicine was built upon: the patient-physician relationship. Take a look at the graph included here. It outlines the growth of administrators in health care compared to physicians over the last forty years. And, it includes an overlay of America’s health care spending over that same time. Take a look at the yellow color. A picture is worth a thousand words, isn’t it? You see, when you have that much administration, what you really have is a bunch of meetings. Lots of folks carrying their coffee from place to place. They are meeting about more policies, more protocols to satisfy government-created nonsense. But, this type of thing in health care isn’t fixing things. It’s not moving the needle. What moves things is innovation. And, innovation isn’t some concept that responds to being forced. It develops when the right chemicals exist in the right moment for an exciting explosion. It happens when someone in a free-market recognizes a problem and creates a business idea to solve it. But, we’ve completely lost this environment for innovation in health care. Medicine has been kidnapped by a bunch of government-driven regulations that cost billions of unnecessary taxpayer dollars for oversight. I get it. We need some administrators. And, I’ve got a few good friends that do this job well. 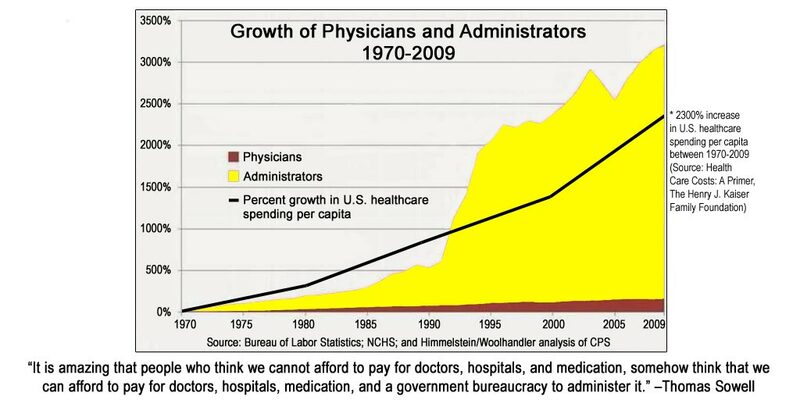 They should be somewhere on the graph, because medical providers need support systems. I get their role. I’ve got a Master’s Degree in health organizational management myself. But, the point I’m making is that the bureaucracy has exploded out of control. When you have so many excessive regulations that you need that many people overseeing checkboxes instead of delivering medical care, you aren’t just stifling innovation, you are having untoward effects on cost control. Medicine used to be about you and me. In fact, where in the world did the patient-physician relationship go? I guess that it left when Medicine did. I don’t care what you do. You can take me out, join me, or get out of my way. But, I’m on a mission to take medicine back.